This paper investigates the graphic memoir trilogy March that U.S. Congressman and civil rights leader John Lewis co-authored with Andrew Aydin and artist Nate Powell. The aim of the article is to describe how justice and injustice are framed in Lewis’ remembrance with regard to Lewis’ slogan of “good trouble.” In particular, it formulates an approach to investigate framing strategies that the work employs within the mediality of comics. Thus, the visual and material frames of the text are examined as techniques to facilitate political framing. Finally, the framing strategies of March will be correlated to the mobilization strategies of the civil rights movement. 1Addressing matters of justice constitutes one of the foundations of the medium of comics. Arguably, the most obvious example would be the popular genre of the superhero narrative, which centers on the struggle of good versus evil and right versus wrong. These fantastic heroes achieve justice for the common people where the state and its institutions fail. But besides the well-known fictional characters of the comics mainstream, a rich tradition of alternative comics has in recent decades established comics as a vessel to address questions of justice in the actual world. In particular, the graphic memoir has become an outlet that gives voice and visibility to marginalized groups (Hatfield 112). U.S. Congressman and civil rights leader John Lewis is the first major public figure in the United States to co-author a graphic memoir: Together with his Digital Director and Policy Adviser Andrew Aydin and artist Nate Powell, he created the March trilogy published in 2013, 2015, and 2016. Lewis and his team employ the medium of comics to tell the story of the American civil rights movement. This article will describe the trilogy as an effort in framing: Not only does a graphic memoir involve situating the elements of the story within panels and grids, but as nonfiction it entails representing actual historical events through a particular perspective on these events—in this case Lewis’—and claiming it as authoritative. In Lewis’ story, particular aspects of the movement are selected and made salient, affect and empathy for his position are generated, and through the logic of the story an understanding of how history unfolded is claimed. The story categorizes and evaluates historical events by assigning interpretative schemata, or frames, to them. In what follows, the central frames of the March trilogy and how they are inscribed into the graphic narrative text will be discussed. This article will employ a multi-level approach to framing, in which frames as cognitive categories will be traced in the textual framings of the work, such as paratexts, frame narratives, and narrative perspective as presented through the visual frame of the comics panels and grids. 3Of course, even before alternative comics received more widespread attention starting in the 1980s, comics have addressed the actual world and have been used for mobilization or propaganda. John Lewis himself claims to have been influenced by a work of graphic nonfiction: Martin Luther King and the Montgomery Story. This 16-page booklet was published in 1957 by the nonprofit organization “Fellowship for Reconciliation” and aimed to educate its readers about the Montgomery bus boycott, the principles of nonviolence, and also to mobilize them to partake in collective action. Concerning Lewis, this aim was evidently successful. The comic is invoked as an intertext in interviews (see for instance Dirks) and within the story (Book One 76) and, consequently, an almost mythical metanarrative around the creation of the March trilogy is created. The booklet, it is claimed, would inspire Lewis to tell his own story and his part in the civil rights movement almost sixty years later in comics form, as well. The resulting trilogy has received much critical acclaim: The honors that the three books received include the National Book Award, the Eisner Award, and the Robert F. Kennedy Book Award. Also, various schools and universities selected parts of the trilogy for their syllabi. As graphic memoirs go, the influence on collective memory that March exerts is therefore considerable. 4This article seeks to investigate the March trilogy as an effort in framing: It will examine how the graphic memoir presents the events depicted with regard to evaluative schemata that are evoked in readers through instances in the text. The focus of this analysis will be framing strategies facilitated by the paratext, the frame narrative that encapsulates the telling of Lewis’ life story, and finally the use of visual framing and perspective. As Christina Meyer (480) and Shane Denson (569) have demonstrated, such formal devices of the graphic narrative book offer fruitful instances to explore larger socially shared cultural frames that the authors encode in their works. 5Framing in the sense of materializing a shape or boundary constitutes a visual and physical necessity for all medial artifacts: The frame of the paratext, including cover, binding, and title is “what enables a text to become a book and to be offered as such to its readers” in the first place (Genette 1). Such boundaries not only delimitate the content but structure and inform the meaning-making process. However, comics conspicuously include the visual frames of the panel and grid, or as Hillary Chute puts it: “[W]hile all media do the work of framing, comics manifests material frames—and the absences between them” (17, see also Böger). Comics narration relies on the work of visual framing as the practice of segmenting the story into separately framed static panels arranged in the complex sequential and spatial composition that Groensteen calls “the multiframe” (43). Concerning the single panel, visual framing in comics then entails “[f]irst the choice of perspective on a scene, and second the choice of borders of the image” (Lefèvre 73). Thus, each panel mandates choices of inclusion and exclusion and the particular point of view that an event is presented from. At the same time, the page layout serves to structure the panel frames and becomes meaningful by positioning the individual elements in relation to each other (Groensteen 23). In the following analysis, the visual and medial frames of March will be investigated as textual instances that are prone to calling up evaluative schemata—or frames—in the minds of its readers. By “framing” an issue or situation in a particular manner, communicators—be they political actors, authors, or “the media”—consciously or unconsciously seek to evoke particular interpretative schemata that align with their aims and convictions. In his seminal definition Robert M. Entman characterizes framing as an act of strategic communication as follows: “Framing essentially involves selection and salience. To frame is to select some aspects of a perceived reality and make them more salient in a communicating text, in such a way as to promote a particular problem definition, causal interpretation, moral evaluation, and/or treatment recommendation for the item described” (52). Frames then constitute normative schemata of conventionalized prototypical world knowledge that “[t]ypically … diagnose, evaluate, and prescribe” an event or situation and thus assign causalities, roles, and relations to the actors and objects involved (Entman 52). 6Concerning categories such as “justice” or “injustice,” this becomes especially relevant: Whether an act is perceived as just or unjust largely corresponds with what frame is called up by the scenario at hand and what evaluative causality it attaches to the situation. Besides prior socialization, this depends on how information on that event is presented: To use an example by David A. Snow, “whether baton-wielding police officers clubbing protesters are seen as riotous or responsible social control agents, depends in part on which of the other elements of the scene are enframed and accented” (124). As this point shows, the cognitive frames that are evoked by a situation depend on the visual and material framings that situation is presented through. Consequently, whether an act of protest is perceived as “good trouble” depends on what its presentation includes and excludes—and what is accented. The semiotic resources of the comic book here become a distinct set of tools to select and enclose specific moments and perspectives within panels and make aspects of the story more salient. 7As a research tool, framing analysis has proven especially productive in the field of social movement studies. It is not hard to see why framing is such an important aspect of protest phenomena: Social movement organizations and their leaders, like John Lewis, are engaged principally in “inspir[ing] and organiz[ing] others to participate in social movements” (Morris and Staggenborg 171). Mobilization efforts entail framing the political status quo as overwhelmingly unjust: “In order for people to be attracted to and participate in collective action, they must come to define a situation as intolerable and changeable through collective action” (Morris 534). Therefore, social movement organizations employ framing strategies to “assign meaning to and interpret … relevant events and conditions in ways that are intended to mobilize potential adherents and constituents, to garner bystander support and to demobilize antagonists” (Snow and Benford, “Ideology” 198). The framing process includes “the generation of diagnostic attributes, which involve the identification of a problem and the attribution of blame or causality” (Snow and Benford, “Master Frames” 138). 8These theories of framing concern mobilization within the scope of an ongoing movement. However, as a graphic memoir March ostensibly presents a retrospective on a historical movement. As such, it asserts “frames of memory” (Bond 11) or “frames of remembrance” (Irwin-Zarecka) that evaluate and shape how the past is remembered. At the same time though, Lewis and his collaborators envisage their work to be inspirational or even instructional to activists of the present. March includes depictions of the original guidelines and codes of behavior (Book One 97; Book Two 118) that could be adopted directly by readers for their own activism. As Markus Oppolzer outlines, March thus constitutes “a memoir that also serves as a recruitment tool for political activism” and has “a clear political agenda that presents the life of a legendary figure to be emulated by a new generation” (235). Here, remembrance and mobilization become intertwined as the authors frame Lewis’ life as a role model that should inspire future activism, connecting the memoir to Lewis’ repeated call to audiences to “Get in trouble. Good trouble” while promoting the books (Colbert). He specifically states that he hopes March will become a “roadmap for another generation” in the same way that Martin Luther King and the Montgomery Story was a “roadmap” to him in the 1960s (Colbert). This aspiration is also reflected in additional March merchandise that was published by Chronicle Books in 2018. These include two enamel pins, one of them stating “Good Trouble/Necessary Trouble” (Lewis, Aydin, and Powell, Pins), a set of “30 Postcards to Make Change and Good Trouble” (Lewis, Aydin, and Powell, Postcards), and a journal, advertised on the product website as “encourag[ing] a new generation of activists to dream, plan, and fight for the causes they care about” (Lewis, Aydin, and Powell, Journal). In the original trilogy, the dedication shared by the three volumes is especially pertinent, which leads directly to the first instance of framing that will be discussed below. 10The paratext thus establishes an explicit space to invoke generic schemata.1 As already indicated above, March contains a dedication that reads “To past and future children of the movement!” Dedicating a book to someone, as Genette suggests, often constitutes a gesture towards the reader, rather than towards the official addressee (134). At the same time, the dedication “is the proclamation (sincere or not) of a relationship (of one kind or another) between the author and some person, group, or entity” (Genette 135). In the case of March, this group is denoted as “the movement” and its past and present children. As the memoirist, John Lewis is positioned with its past children and asserts his authority to report on the movement. In turn, dedicating the work to its “future children” serves as a direct invitation to the readership to become part of the group with its many famous individuals and “get into good trouble.” In a gesture of continuity, “the movement” is envisioned as an ongoing enterprise rather than a purely historical event. The actual story then becomes the initiation ritual of Lewis passing down his memories to teach the next generation of activists. His commitment to justice and nonviolence has taken him from an Alabama sharecropper’s farm to the halls of Congress, from a segregated schoolroom to the 1963 March on Washington, and from receiving beatings from state troopers to receiving the Medal of Freedom from the first African-American President. 12This paratext thus establishes a rags-to-riches narrative, which suggests that Lewis’ “commitment to justice and nonviolence” was the reason for his successful part in changing the U.S. in the second half of the twentieth century, which ultimately paved the way for the first black man to become U.S. president. In a story of racial uplift, the initial unfavorable situation, which was shaped by poverty, racism, and oppression, is directly juxtaposed to the favorable outcome in the end, his position as law-maker, role as civil rights leader, and recipient of the highest civilian honor of the United States. This personal, political, and moral success is then decidedly located within the democratic institutions of the United States. Likewise, peaceful protest is presented as leading to political success and ultimately as a patriotic endeavor. In the third volume, the text on the front flap ends: “Through an unforgettable literary and artistic narrative, March portrays the surpassing courage, sacrifice, and revolutionary nonviolence that transformed American society in the 1960s, guided by principles and tactics that remain vitally relevant in the modern age.” Here, the “principles and tactics” of the civil rights movement are furthermore presented as essential for the present, a claim that is substantiated by stating Lewis’ successes. 13The back cover of each volume includes a testimonial blurb of a public figure. The second and third installment feature praise from cartoonist Raina Telgemeier and Star Trek-actor LeVar Burton and are therefore likely intended to appeal to regular comic book readers. In contrast, the first book as well as the slipcase of the boxed set that comprises all three volumes includes a commendation of President Bill Clinton that is clearly intended to draw first-time comics readers to the trilogy. 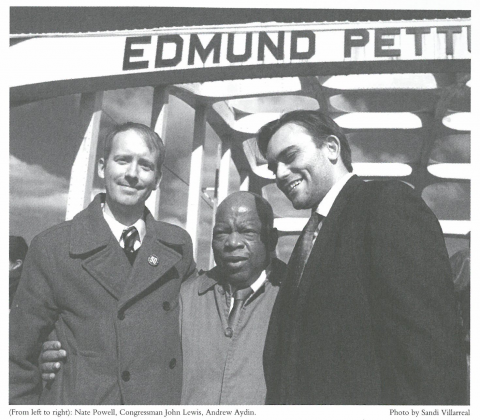 It reads: “Congressman John Lewis has been a resounding moral voice in the quest for equality for more than 50 years .… In March, he brings a whole new generation with him across the Edmund Pettus Bridge, from a past of clenched fists into a future of outstretched hands.” The fact alone that a former President of the United States would lend his praise to a comic book serves as an indicator of Lewis’ status—as well as that of the medium of comics. Clinton, too, invokes a trajectory from hostility to reconciliation. While he does not mention the place of the present on that historical arc, he also does not place blame but introduces morality and equality as universal values that are embodied by John Lewis. Clinton’s statement moreover situates a history of mass protest within a frame that claims the United States’ institutions as ultimately just and envisions civil resistance as a means towards reconciliation. 15The image shows Lewis embracing the two younger white men to his left and right. All three are smiling on what in the black and white photograph appears to be a sunny day. Significantly, this photograph is the final visual object that readers are presented with: Returning to this highly symbolic place with a gesture of peace and friendship thus triumphantly and conclusively reframes the horror of the “Bloody Sunday” into a message of reconciliation. The displayed friendship is not only interracial but also cross-generational, pointing once more to historical progression toward a better future. In this manner, the photograph of the three creators presents the whole project of March as an achievement of a harmonious present—standing, of course, in stark contrast to the struggles of the past as remembered by Lewis. The paratext thus highlights Lewis’ character and commitment and introduces March as an exemplary and inspirational success story. It attributes his success to abstaining from violence against the state and presenting peaceful protest as a patriotic activity. The reconciliatory framing that the paratext provides is continued and specified within the story. The next section will discuss how the story is framed by its different levels within the narrative and through its particular perspectives on the narrated events. 16Storytelling functions as a means of framing par excellence: Narrative assigns causality to events along the lines of conventionalized patterns and expectations. Snow therefore explicitly describes the function of framing as “tying together the various punctuated elements of the scene so that … one story rather than another is told” (124). Stories represent the world from a particular perspective, within a certain causal logic, and they can only include the events that the storyteller deems relevant for their point. Theories of cognitive narratology envision readers as constructing a “storyworld” from a narrative discourse: a mental model for the events taking place, which is governed by the rules and logic presented in the text. Since no text can ever be complete, readers rely on their world knowledge to presume what is not explicitly mentioned. As Mary-Laure Ryan has demonstrated in her “principle of minimal departure,” even when reading fiction, knowledge of the actual world serves as a frame of reference to fill gaps within the story if no contraindication is provided (51). Inferences drawn from the narrative discourse are then situated within this system of rules, which is in turn constantly reevaluated in light of new information and, if need be, updated (Herman 107; Kukkonen 25-7). Of course, inferences are shaped by their textual framing as well: “Inferences are often context-dependent: they make sense of a particular clue in the context of a particular panel, a particular page, and a particular story” (Kukkonen 22). In nonfiction, the storyworld that is put forth is presented as corresponding to the actual events, which in turn suggests that the rules that govern and tie together the story also apply to the actual world. Hence, nonfiction narratives assert a particular understanding of the world according to the particular rules that storytellers provide based on their values and ideology. In other words, nonfiction stories imply to readers how the world supposedly works. 17This section will discuss how the structure of the narrative informs the meaning-making process. Firstly, the framing function of narrative levels will be considered: Here, one story is “embedded” within another, which then serves as a “frame narrative” (cf. Duyfhuizen 186-7; Bal 57). March encompasses two main temporal strands: that of the present as a frame narrative, which introduces Lewis as narrator, and that of the past, the story of the movement. The embedded narrative here serves as the “explanation” (cf. Bal 58) of the frame narrative in that it shows how the present state was achieved: John Lewis’ life is told as an embedded narrative that exhibits what made the inauguration of President Obama possible. In the frame narrative, Lewis by chance meets a woman with her two sons, Jacob and Esau, before Obama’s inauguration—a fictionalized account of an actual encounter, as Andrey Aydin explains in an interview (Lartey). Before they attend the inauguration, she wants to show Lewis’ office to her sons so that they can learn about the history of the civil rights movement. Lewis then willingly tells his own life story to the awestruck family. While the frame narrative is not upheld consistently, as Chaney points out (Reading 173), the inauguration as the conclusive event of the story pervades the narrative discourse at key moments. Thus, the inauguration “operates as a narratival lightening rod,” reminding readers of the eventual success of the movement and its “happy ending”—aligning the story with “the classic narrative within the black narrative tradition of uplift” (Chaney, “Boundary” 54). In the same vein, the second book starts with an iconic interracial handshake also at the inauguration. Here, the narrative strand of the past is taken up without metadiegetic embedment. Lewis is told to hurry for the inauguration and responds in a prophetic-seeming comment, “There’s no need to hurry—I’ll end up where I need to be.” Before returning to the past, the authors once more reiterate the eventual success of the movement and the unwavering confidence in the triumph of good over evil. Thus, the embedded narrative can only be understood from the logic provided by the frame narrative, which stresses eventual success and reconciliation. 18The relevance of the frame narrative is furthermore underlined when past and present are intertwined at key moments. Here, elements from both timelines overlap with one another: In a moment of doubt and setback in the second book (50), the speaker announcing “Ladies and Gentlemen” during the Obama inauguration is included at the bottom of the page narrating the past and continues on the next one with “The President-elect of the United States, Barack H. Obama,” which switches to the present. This technique of overlaying images of the past with representations of diegetic sound from the present is taken up again with Aretha Franklin’s rendition of “My Country, ‘Tis of Thee” during the inauguration (Book Two 79-82). Her singing is displayed as a banderole that extends into the moments of the past on the pages that precede and follow it. Moreover, on the double page spread showing Franklin singing, smaller panels are dispersed across the page displaying glimpses from the traumatic past. Similar to the announcement of President Obama, the song is included in the narrative discourse as a contrast to moments of extraordinary violence in the past. When the third book opens somewhat more darkly with a terrorist attack on the Sixteenth Street Baptist Church in Birmingham in 1963, the lyrics of “The Star-Spangled Banner” connect past and present, and the discourse turns briefly to the inauguration before the story proper begins. It is mainly in bleak moments of terror and misery that the reader is reminded that all this suffering serves a specific end and that victory is inevitable. At the same time, these parallelisms also serve as a reminder that the harmonious present that the narrative suggests was achieved through great personal sacrifices. Here, music and song become the connecting element that transcends times and ties together past and present as one epic struggle. 19After many setbacks and immense violence both by the state and rightwing terrorists, the narrative finally culminates in the 1965 Voting Rights Act being signed (Book Three 240). Lewis as narrator comments: “That day was the end of a very long road. It was the last day of the movement as I knew it.” His speech is displayed against the exchange of a pen from a white to a black hand as the other two hands embrace each other in an image of lasting reconciliation (Book Three 243). The narrative then switches for one last time to the present after the Obama inauguration. Lewis retires to his room, where sitting alone on his bed he finds a voicemail by Ted Kennedy, who reminisces about the civil rights movement and “the people who didn’t live to see this day,” specifically pairing John Lewis with Martin Luther King (Book Three 245). This penultimate event in the story accentuates once again Lewis’ affiliation with other historical figures and testifies to Lewis’ status as the last living icon of the movement. After this tribute to fallen comrades, the book finally ends on a lighter note with a metaleptic conversation between Lewis and Aydin in which Lewis decides to get back to “that comic book idea” (Book Three 246). 20In the frame narrative, March continuously points towards the eventual success of the movement and the achievement of justice. The storyworld is thus governed by an unwavering logic of victory of good over evil and eventual success, even in the darkest of moments. Likewise, the inauguration continually reminds the reader that the eventual success will come from within the institutions of the United States. The next section will examine how the story of the movement itself is framed through means of comics storytelling. 21The frame narrative not only brackets the story of the movement but also introduces John Lewis as telling his own life story as an autodiegetic narrator. This entails that we are presented with his own perspective on the historical events as told by himself. In narratology, perspective is generally understood within the terms of the Genettian concept of “focalization”: “the filtering of a story through a consciousness prior to and/or embedded within its narratorial mediation” (Horstkotte and Pedri 330). Focalization entails “the perspectival restriction and orientation of narrative information relative to somebody’s (usually a character’s) perception, imagination, knowledge, or point of view” (Jahn 173). This also entails access to Lewis’ subjective experience as a real person and historical witness, including his private emotional responses. David Herman suggests the concept of “qualia” to describe this sort of access to a character’s mind—a “term used by philosophers of the mind to refer to the sense of what it’s like for someone or something to have a particular experience” (144). Presenting an individual and thus highly subjective perspective on history works as a potent framing device that not only “filters” the story through selection and makes it salient but also invites emotional attachment. 23Finally, the panel borders themselves are broken with billowing tear gas that exits the panel and fills the page. Next, Lewis’ traumatic experience of being beaten unconscious is represented: Page nine shows a progression of Lewis being pulled away by his legs from a high angle, which switches to his field of vision in the next panel, including his arms and hands. Speed lines on the ground suggest the movement of being pulled, and a shadow on the ground menacingly indicates the club-swinging trooper above him. Again, Lewis’ disembodied hands break the panel border, as he is being dragged out of the readers’ vision. What comes next is an entirely black panel before a background exhibiting a jagged edge that separates the page into black and white. The moment of “blackout,” in which Lewis loses his consciousness, is translated metaphorically onto the visual level and emulates the traumatic bodily experience in the reading process. 24Graphic narrative oftentimes employs such “representational techniques to produce affect in the reader and, in doing so, mimic (some part of) the feelings and experience of trauma” (Earle 43). This mode is taken up again at several points in the story, for instance, when Lewis is arrested. Here, the black of the inside of the police van spreads onto the whole page in a visual metaphor for emotional distress (Book Two 25). The moment of Lewis’ near-death on the Edmund Pettus Bridge is also taken up again at the end of the third volume: After several close-ups of Lewis’ eyes and the line—“I thought I saw death. I thought I was going to die.”—the next double page spread changes from the heavy black style to a pale white style as Lewis is shown in a trancelike walk which is continued for several pages (see fig. 3). 25As Lewis enters the door of Brown Chapel to safety the style switches back to black. In this scene, his near-death experience is evoked by the graphic style, allowing us to participate in the profoundly traumatic experiences that he had to suffer. This way, March has an effect strikingly different from the iconic video footage and photographs that were taken on that day and which served to raise awareness and generate sympathy across the U.S. at the time. While those images were taken by journalists on the sidelines, here the vantage point is from within the action, thus generating empathy for Lewis’ suffering as the incident is recreated as an affective bodily experience. 26However, March is not a trauma narrative in a narrow sense. While the work produces affect in its readers, it presents the traumatic experience as a catalyst for the eventual goal of the movement. At the beginning of the first book, after Lewis is being beaten and thus forcefully silenced, the page turns towards an impressive double page inside cover that allows readers to gaze over the Lincoln Memorial and towards the sunrise behind the Washington Monument. Above the low horizon the letters “MARCH” fill the entire sky. Thus, Lewis’ hardest moment of hardship and suffering is contrasted with an iconic vision of redemption and an eschatological promise. Rather than “working through” the trauma, the traumatic experience becomes a noble and necessary sacrifice that is presented as part of raising “good trouble.” The sheer horror of traumatizing violence is paired with the promise of the better future from which the story is told, presenting a storyworld in which nonviolent resistance is inevitably successful, and sacrifice is ultimately rewarded. Christlike, Lewis’ suffering is presented as a gateway to eventual salvation. 27Chaney thus rightly claims that “[t]he narrative structure of March presents John Lewis as messianic” (“Boundary” 53). Strong references to Christianity are present throughout the entire story: The impact of reading the Bible as a young man is emphasized through the visual metaphor of the words “Behold the lamb of god which taketh away the sin of the world” being drawn upon and filling Lewis’ head and body (Book One 27). Similarly, the word of God in moments of religious awakening is displayed as an all-encompassing solution (Book One 78). Another memorable moment shows Lewis as a boy preaching to a flock of chickens on his parents’ farm. Through these allusions to Christianity and Christ-like suffering March invokes a frame of reference in readers that categorizes activists who stoically suffer violence and quite literally “turn the other cheek” as not only noble but eventually victorious. The storyworld of March is thus governed by the Christian logic of self-sacrifice and nonviolence that underlie the frame of thought that shapes that story. As a framing effort directed at possible “future children” this logic prescribes abstaining from using violence while suggesting that such noble sacrifice will ultimately be rewarded by God. 28Finally, this leaves the question of attributing blame. Within the storyworld of March, blame is essentially put on those that exert violence. This includes the police, white supremacists, and Ku-Klux-Klan terrorists, who are at the same time seldom individualized. Instead, Powell uses the affordances of cartooning to expose violence through grotesquely distorted cartoon faces or to mock the complacency of uncaring bystanders (see for instance Book One 100). Violence is thus tantamount to ugliness. Only in few cases are adversaries of the movement identified and drawn in a naturalistic manner—all of whom are racists in positions of state authority. March seeks to pair the grace of nonviolence with the repulsiveness of violence, placing blame on those who resort to it. At the same time, the authors carefully avoid blaming white people or white southerners in general, and instead they single out individuals rather than groups. The evil of racism is exposed through its grotesque and repulsive violence, which is contrasted with graceful nonviolent resistance as the path to reconciliation, racial harmony, and true Christianity. 29The historical civil rights movement is well-researched concerning the frames that were employed for mobilization. Snow and Benford introduce the notion of “master frames” that transcend individual organizations and unite a whole movement. They locate the “master frame” of the civil rights movement as firmly situated in the discourse of universal human rights. Moreover, they claim that “blame is externalized in that unjust differences in life circumstances are attributed to the encrusted, discriminatory structural arrangements rather than to the victims’ imperfections” (“Master Frames” 139). This frame “accented the principle of equal rights and opportunities regardless of ascribed characteristics and articulated it with the goal of integration through nonviolent means” (“Master Frames” 145). Morris and Staggenborg reject this assessment of the principal role of the “rights”-frame. Rather, they claim that the movement “drew primarily on the ‘freedom and justice’ frame of the black church rather than the ‘rights’ frame of the courts” (Morris and Staggenborg 192). Instead, “[t]he theology of the black church, largely expressed through the sermons of preachers, emphasized the biblical foundations of freedom and justice and the liberation rhetoric of great biblical personalities” (Morris and Staggenborg 185). 30March in a way reconciles both of these master frames by presenting the struggle for civil rights within the courts as a Christian salvation narrative. In its “frame of remembrance,” March highlights reconciliation and prominently situates the movement in the logic of a success story, specifically “a success story of black Christian vocation” (Chaney, “Boundary” 52). As such, Lewis’ life is presented as a time-tested role model for future generations. In doing so, March seeks to reproduce the approach of Martin Luther King and the Montgomery Story and “continues a chain of almost larger-than-life role models … who find willing disciples and teach them their philosophy, but also take action in the face of seemingly insurmountable odds” (Oppolzer 233). Hardship, brutality, and suffering are thus presented as a gateway to eventual salvation. At the same time, the rights and liberties of the Obama era had to be painfully earned by the personal sacrifice of people like John Lewis. This way, March aligns with the quote “the arch of the moral universe is long, but it bends toward justice” by abolitionist Theodore Parker, which Martin Luther King adapted for the civil rights movement. The trilogy employs a reconciliatory tone that locates racism in the past, displays a present of racial harmony, and accentuates the role of white supporters in the civil rights movement. As an overarching frame, the concept of nonviolence provides the central moral evaluative category and prescribes what kind of actions are acceptable in past and future protest movements. 31Of course, the historical success of the movement stands for itself: “The most distinctive aspect of the modern civil rights movement,” as Morris summarizes, “was its demonstration that an oppressed, relatively powerless group, can generate social change through the widespread use of social protest.” Thus, “[f]or nearly two decades, this movement perfected the art of social protest” (524). But while the civil rights movement succeeded historically, proving the approach right, the authors of March have no such evidence that these tactics are indeed readily transferrable onto the political landscape of the present and future. Lewis’ slogan “good trouble” establishes a frame that determines which forms of protest are acceptable and which ones are not. This frame does not necessarily align with the protest tactics of current civil rights activists. The website Buzzfeed reports a confrontation between Lewis and Black Lives Matter-protesters at a Hillary Clinton campaign event before the 2016 presidential election. When the protesters tried to interrupt her speech, Lewis urged the protesters to cease the interruption and “respect everyone’s right to be heard.” While he later acknowledged their effort to “speak out,” Lewis mandates that “you do that in a non-violent, orderly fashion,” citing “his own” movement again as an example of “good trouble” (Sands). This incident may be symptomatic for March as an effort in framing: The trilogy maintains a clear set of values that are presented as the path to salvation without an alternative. This framing obviously sits well with the remembrance of the past and its victories, but one may ask whether it is too restrictive to resonate with present-day activists. The celebratory tone concerning the harmonious and just present alone may prove detrimental to mobilize prospective activists. Then again, it is evident that the desire to inspire “future children of the movement” refers to an abstract ideal of activism, rather than presenting any concrete call to action. Bal, Mieke. Narratology: Introduction to the Theory of Narrative. Toronto et al. : U of Toronto P, 2009. Böger, Astrid. “Kreative Zwischenräume. Medienästhetische Strategien des Rahmens und Übersetzens in Graphic Novels.” Übersetzen und Rahmen. Praktiken medialer Transformationen. Ed. Claudia Benthien and Gabriele Klein. Paderborn: Fink, 2017. 75-87. Bond, Lucy. Frames of Memory after 9/11: Culture, Criticism, Politics, and Law. Basingstoke: Palgrave, 2015. Chaney, Michael A. Reading Lessons in Seeing: Mirrors, Masks, and Mazes in the Autobiographical Graphic Novel. Jackson, MS: UP of Mississippi, 2016. ---. “On the Nature of the Boundary in Comics Memoir: The Case of March.” Comic an der Grenze. Sub/Versionen von Form und Inhalt. Ed. Mattias Harbeck, Linda-Rabea Heyden, and Marie Schröder. Berlin: Bachmann, 2017. 49-58. ---. “Misreading with the President: Re-reading the Covers of John Lewis’s March.” International Journal of Comic Art 20.1 (2018): 25-42. 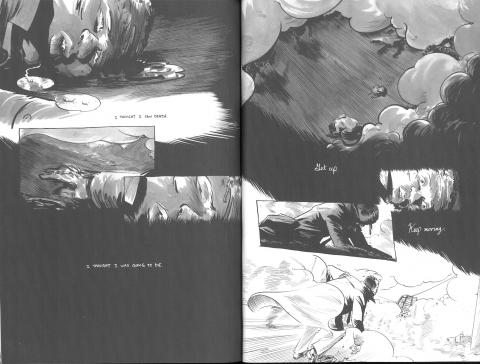 Chute, Hillary L. Disaster Drawn: Visual Witness, Comics, and Documentary Form. Cambridge, MA: Harvard UP, 2016. Denson, Shane. “Frame, Sequence, Medium: Comics in Plurimedial and Transnational Perspective.” Transnational American Studies. Ed. Udo J. Hebel. Heidelberg: Universitätsverlag Winter, 2012, 561-580. Dirks, Sandhya. “Graphic Novel Depicts John Lewis’ ‘March’ Toward Justice.” npr. 3 Aug. 2013. Online. www.npr.org/sections/codeswitch/2013/08/31/216884526/graphic-novel-depicts-john-lewis-march-toward-justice. Accessed: 1 Feb. 2019. Duyfhuizen, Bernard. “Framed Narrative.” The Routledge Encyclopedia of Narrative Theory. Ed. David Herman, Manfred Jahn, and Marie-Laure Ryan. London and New York: Routledge, 2008, 186-188. Earle, Harriet E. H. Comics, Trauma, and the New Art of War. Jackson, MS: UP of Mississippi, 2017. Eisner, Will. Comics and Sequential Art. New York: Norton & Company, 2008. Entman, Robert M. “Framing: Toward Clarification of a Fractured Paradigm.” Journal of Communication 43.4 (1993): 51-58. Fellowship for Reconciliation. Martin Luther King and the Montgomery Story. Marietta, GA: Top Shelf Productions,  2014. Genette, Gérard. Paratexts: Thresholds of Interpretation. Trans. Jane E. Lewin. Cambridge et al. : Cambridge UP, 1997. Gonzales, Tony. “In Nashville, Rep. John Lewis Gets Surprise from His Civil Rights Past.” npr. 21 Nov. 2016. Online. www.npr.org/2016/11/21/502918030/in-nashville-rep-john-lewis-gets-surprise-from-his-civil-rights-past. Accessed: 1 Feb. 2019. Groensteen, Thierry. The System of Comics. Jackson: UP of Mississippi, 2007. Hatfield, Charles. Alternative Comics: An Emerging Literature. Jackson: UP of Mississippi, 2005. Herman, David. Basic Elements of Narrative. Malden, MA et al. : Wiley-Blackwell, 2009. Horstkotte, Silke, and Nancy Pedri. 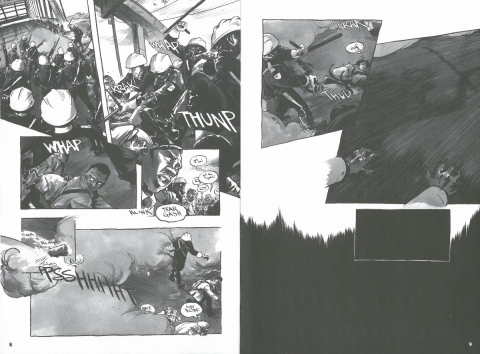 “Focalization in Graphic Narrative.” Narrative 19.3 (2011): 330-357. Irwin-Zarecka, Iwona. Frames of Remembrance: The Dynamics of Collective Memory. London and New York: Routledge, 2007. Jahn, Manfred. “Focalization.” The Routledge Encyclopedia of Narrative Theory. Ed. David Herman, Manfred Jahn, and Marie-Laure Ryan. London and New York: Routledge, 2008. 173-177. Kukkonen, Karin. Contemporary Comics Storytelling. Lincoln, NE: U of Nebraska P, 2013. Lartey, Jamiles. “John Lewis: ‘I don’t think I’ve changed much. I still consider myself an activist.’” The Guardian. 16 Aug. 2016. Online. www.theguardian.com/books/2016/aug/16/john-lewis-congressman-march-graphic-novel-civil-rights-memoir. Accessed: 1 Feb. 2019. The Late Show with Stephen Colbert. “Congressman John Lewis: ‘Get in Trouble. Good Trouble.’” 1 Sep. 2016. Online. www.youtube.com/watch?v=6ATwisIrtfg. Accessed: 1 Feb. 2019. Lefèvre, Pascal. “Mise en scène and Framing: Visual Storytelling in Lone Wolf and Cub.” Critical Approaches to Comics, Theories and Methods. Ed. Matthew J. Smith and Randy Duncan. New York: Routledge, 2012. 71-83. Lewis, John, Andrew Aydin, and Nate Powell. March Book One. Marietta, GA: Top Shelf Productions, 2013. ---. March Book Two. Marietta, GA: Top Shelf Productions, 2015. ---. March Book Three. Marietta, GA: Top Shelf Productions, 2016. ---. March: 30 Postcards to Make Change and Good Trouble. San Francisco, CA: Chronicle. Online. www.chroniclebooks.com/march-30-postcards-to-make-change-and-good-trouble.html. Accessed: 1 Feb. 2019. ---. “March Twin Pins.” San Francisco, CA: Chronicle. Online. www.chroniclebooks.com/march-twin-pins.html. Accessed: 1 Feb. 2019. ---. March Journal. San Francisco, CA: Chronicle. Online. www.chroniclebooks.com/march-journal.html. Accessed: 1 Feb. 2019. Meyer, Christina. “‘Putting it into boxes’: Framing Art Spiegelman’s In the Shadow of No Towers.” Trauma’s Continuum September 11th Re-visited. Ed. MaryAnn Snyder-Körber and Andrew Gross. Special Issue of Amerikastudien/American Studies 55.3. (2010): 479-494. Morris, Aldon D. “A Retrospective on the Civil Rights Movement: Political and Intellectual Landmarks.” Annual Review of Sociology 25 (1999): 517-539. Morris, Aldon D., and Suzanne Staggenborg. “Leadership in Social Movements.” The Blackwell Companion to Social Movements. Ed. David A. Snow, Sarah A. Soule, and Hanspeter Kriesi. Malden, MA et al. : Blackwell, 2004, 171-196. Oppolzer, Markus. “John Lewis’ March—Promoting Social Action through Comics.” Geschichte im Comic. Befunde – Theorien – Erzählweisen. Ed. Bernd Dolle-Weinkauf. Berlin: Bachmann, 2017, 225-237. Ryan, Marie-Laure. Possible Worlds, Artificial Intelligence, and Narrative Theory. Bloomington and Indianapolis: Indiana UP, 1991. Sands, Darren. “Rep. John Lewis: Black Lives Matter Protesters Should Respect Everyone’s Right To Be Heard.” Buzzfeed. 30 Oct 2015. Online. Snow, David A. “Frames and Framing Processes.” Protest Culture: A Companion. Eds. Kathrin Fahlenbrach, Martin Klimke, and Joachim Scharloth. New York and Oxford: Berghahn, 2016, 124-129. Snow, David A., and Robert D. Benford. “Ideology, Frame Resonance, and Participant Mobilization.” International Social Movement Research 1 (1988): 197-217. ---. “Master Frames and Cycles of Protest.” Frontiers in Social Movement Theory. Ed. Aldon D. Morris and Carol McGlurg Mueller. New Haven, CT: Yale UP, 1992, 133-155. Johannes C. P. Schmid is a doctoral candidate at the Department of English and American Studies at the University of Hamburg. He is the author of Shooting Pictures, Drawing Blood: The Photographic Image in the Graphic War Memoir (Bachmann 2016), and co-editor of Praktiken medialer Transformationen: Übersetzungen in und aus dem Digitalen Raum (Transcript 2018) as well as a forthcoming special issue of ImageTexT titled “Graphic Realities: Comics as Documentary, History, and Journalism.” For his Master’s thesis, he was presented with the 2015 American Studies Award of the University of Hamburg, as well as the 2016 Roland Faelske-Award for Comics and Animation Studies. In his dissertation project, he explores framing strategies in documentary comics.